challenges. T2DM patients often end up on insulin, which is expensive and can lead to serious side effects. previously unrecognized antibiotic properties because sulfonylurea are derivatives of sulfonamide antibiotics (Sulfa drugs). 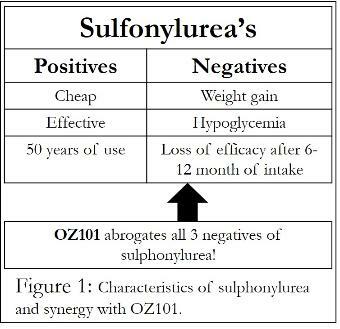 sulfonylurea side effects occur due to their chronic intake and inadvertent reduction in patient’s Essential Gut Good Bacteria. years without the need for a dose change or intake of other anti-diabetes drugs. (GRAS) status by the USFDA, TGA, EMEA and other major regulatory authorities. 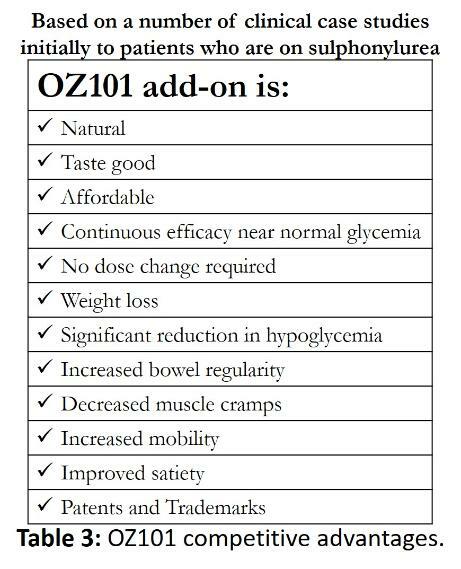 OZ101 will be marketed as a "Medical Food"
and must be used under a physician supervision. To receive free samples of OZ101 prebiotic, please do not hesitate to contact us at "info@glyconmedics.com". glucose levels. When food is digested, glucose is released into the blood stream causing an increase in blood glucose levels. sufficient insulin, T2DM patients are unable to lower blood glucose levels back to the recommended level (5.5-7mmol/L). exercise and overweight. Diabetes is an old disese and the earliest mention of diabetes was around 1552 BCE. accounting for over 5.7% of the world population, and is drastically rising. the heart and the kidney. Thus, there is an immediate need for better, safer and ideally cheaper treatments for T2DM. Based on a number of clinical case studies, competitive advantage of OZ101 is highlighted in table 3.